This was another fun leather project. Many years ago (20? 25? 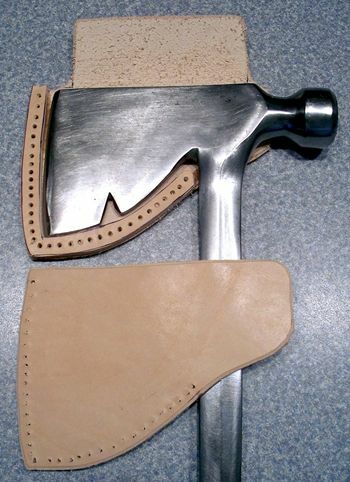 ), I purchased an Estwing “Rigger’s Axe” for use as a camp axe. 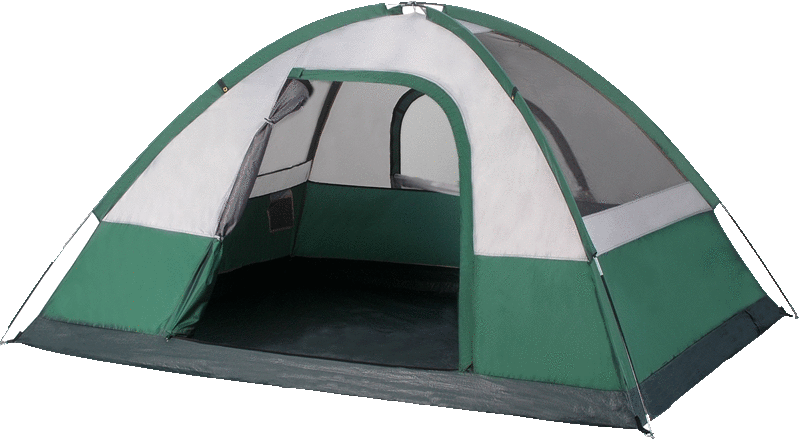 It spends 95% of its life in one of my camp boxes, next to the propane bottles, the Coleman lantern, and the single-burner catalytic heater. The other 5% of the time it sits on the ground next to the fire pit at camp. I must admit that I have not taken good care of it over the years. Every 5 years or so, I’ll give it a fresh edge. It’s life history has basically been one of neglect. Happily, that’s one of the greatest strengths of an Estwing. Because the head and handle are forged from a single piece of steel, there’s not much that you can do to kill an Estwing axe. I got to thinking about my poor axe a couple of weeks ago, so I pulled it out of the camping box. I frowned when I saw the orange-brown layer of rust that covered the exposed metal. Feeling guilty for the neglect, I reached for my drill and a flapper type sanding wheel and went to work. That did the trick. It was all bright and shiny now. Then I took it to my benchtop belt sander and gave it a fresh sharpening. My axe and I both felt a lot better now. That’s when I decided that I needed to make a leather cover for it. It has never had a cover all these years. I laid the axe down on a piece of paper and started thinking about how a cover for it could work. I ended up with the design you see here. 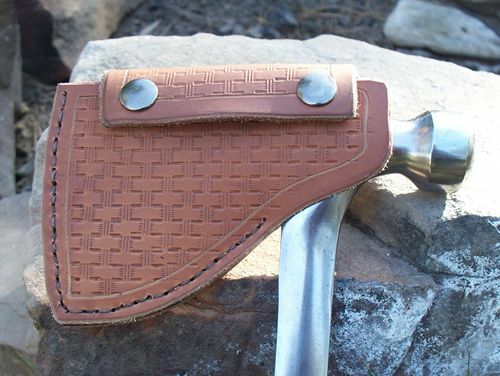 It is made out of three pieces of thick leather – the type you might use for a handgun holster. The back piece has a flap that folds over and snaps to the front piece. The middle layer is what is called a “welt”. It prevents the sharp edge of the blade from contacting the stitching and provides a pocket for the thickness of the axe blade. After the three pieces were cut out from patterns drawn onto the paper, I started by punching the series of stitching holes in the welt. Using super glue, I attached the welt to the rear piece. Now I used the holes in the welt as a guide to drill matching holes in the rear piece. Next I drilled from the rear to the front to create matching stitch holes in the front piece. I started by drilling three holes in the front piece at the two ends and one at the bottom corner. I temporarily fixed the front cover at these points by tying them with thread while I finished drilling all the holes. Since I wanted to advance my leather crafting skills to the next step, I decided to try my hand at creating a basket weave pattern to add interest. I started with the stitching groover tool to create a border for the basket weave pattern. The basket weave tool is a simple stamp that you tap with a mallet onto the moistened leather – over and over and over again! If you look closely at the picture, you will see some overruns where I stamped past the border. Oh, well, I’m still learning. Then I did the stitching to put it all together. By the way, Tandy Leather has a very good series of videos on YouTube to teach many of the techniques you need to do this stuff. The lessons were invaluable to me. I found that due to the thickness of the leather, the flap was very difficult to fold over. I ended up fixing this problem by thinning the backside of the flap on my belt sander. While I was at it, I used the belt sander to even up the edges where the three pieces of leather come together. Then it was just a matter of fixing the snaps into place, then rubbing in several applications of neatsfoot oil to give the cover a nice mellow brown color. Leathercraft can be a very useful tool in your outdoorsman’s skill set. Start simple and go from there.